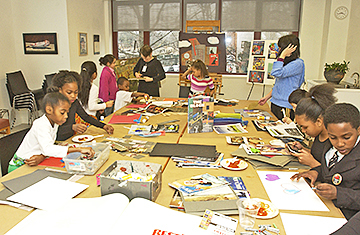 IN THE STYLE OF BEARDEN: Maria Evans (at rear) is helping children construct collages in the style of Romare Bearden during the Arts Councils Black History Month celebration at the Paul Robeson Center for the Arts. Princeton Regional Schools (PRS) Superintendent Judy Wilson said she would be shocked if any of the money allocated in the Federal governments recently approved economic stimulus package landed in our coffers. Speaking at a recent Board of Education budget workshop, she described the flat budget scenario the PRS administration is anticipating for 2009-2010. Continuing the discussion about the 2009 budget, last Tuesdays meeting of Borough Council focused on capital projects and debt management. Neighbors advocating for the rehabilitation of Harrison Street Park were also in attendance. Collaborative projects involving the Engineering Department and the Sewer Operating Committee dominated Monday evenings Township Committee Meeting. The Princeton Public Librarys actual 2008 expenditures of $4,655,934 came within a few dollars of the $4,679,327 originally budgeted. Though no formal action was taken during last Thursdays Regional Planning Board meeting, Bob Hillier of Hillier Properties LLC, explained his proposal for building 143 units of housing for residents aged 55 and over on Princeton Ridge for an informal review of the concept plan. As it played last weekend to wrap up the regular season, the Princeton University womens hockey team had to come through on the road in order to earn home ice for the upcoming ECAC Hockey playoffs. Walking through Luxe Home Companys charming, spacious showroom is a pleasure. The expanse of windows allows the space to be filled with light, enhancing the impressive array of furniture and accessories.